Camping kitchens that use solar ovens enjoy many benefits over traditional cooking over an open fire. To begin, they provide a level of safety that you don’t get with the open fire cooking methods. If there are children around the campsite, then you can have peace of mind that they won’t be any danger of them getting burned. Also, if the campsite is dry from lack of rain, then you will eliminate the danger of starting a forest fire. With a solar oven, you can set up the meal to be cooked and go about your activities for hours at a time while the meal cooks, and when you return your dinner will be ready. There is no need for stirring or attending to the cooking as the moderate temperatures will insure that the food doesn’t burn. Some of the other benefits are solar ovens are quiet and require no fuels to operate, relying on free abundant solar energy. Also, having a solar cooker in your camping equipment will also allow you to sanitize water if necessary, or heat up water for a nice pot of coffee or tea. 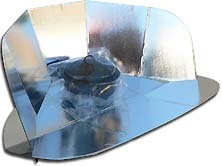 A solar oven converts sunlight to heat energy by reflecting off of multiple reflective surfaces. They need to positioned in a spot that is sunny for several hours and protected from strong wind. A dark shallow pot will cook the food the best, and a tight fitting lid to hold in the heat and moisture is also recommended. Often times a heat resistant plastic bag is wrapped around the pot to hold even more heat in. There are 3 common types of solar cookers. Curved concentrators (parabolics), heat trap boxes and panel cookers. Among these 3 types there are many forms of these in existence. These ovens cook fast at high temperatures and require more adjustment and supervision to operate safely. These cookers look like a small satellite dish, with the pot hanging in the center area and work best for larger scale cooking. These cookers cook at moderate to high temperatures and are as the name suggests, a box with a lid, and can accommodate more than one pot. These a types of solar cookers are found extensively worldwide. These cookers have some of the combined elements of the other two and are relatively inexpensive and are much more portable as they can be folded up for easy transportation. These are the cookers that work best if you intend on hiking to your campsite.